Slieve Anierin standing proudly near the town of Ballinamore, Co. Leitrim is a mountain that I have long admired but somehow never seemed to get around to actually walking. 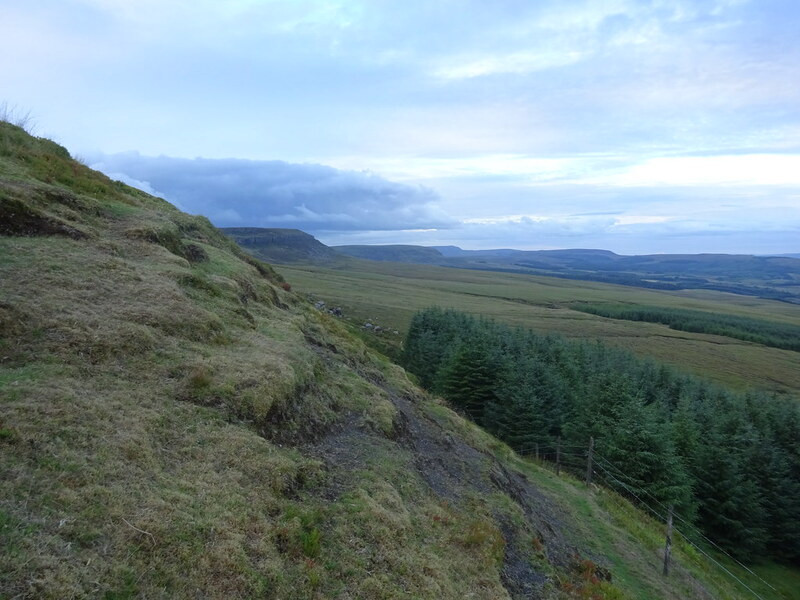 Its bulk and steep cliffs cut an imposing figure when viewed from afar, and over the years I had learned of how the local community have promoted it for visitors, including establishing waymarked trails onto and around the mountain. 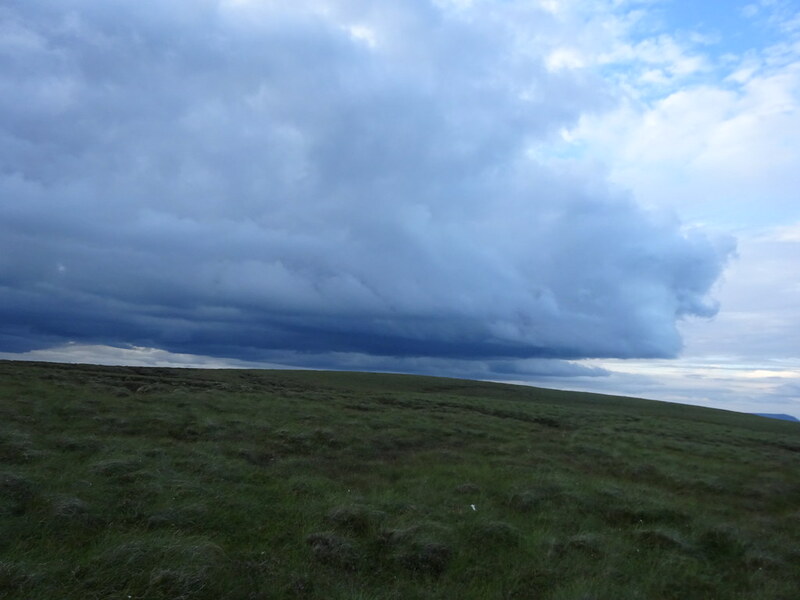 It was therefore with some optimism that I ventured there on a recent Sunday evening, referencing Donegal, Sligo & Leitrim: A Walking Guide by Adrian Hendroff, OSi Discovery Series map 26, and a number of online sources. 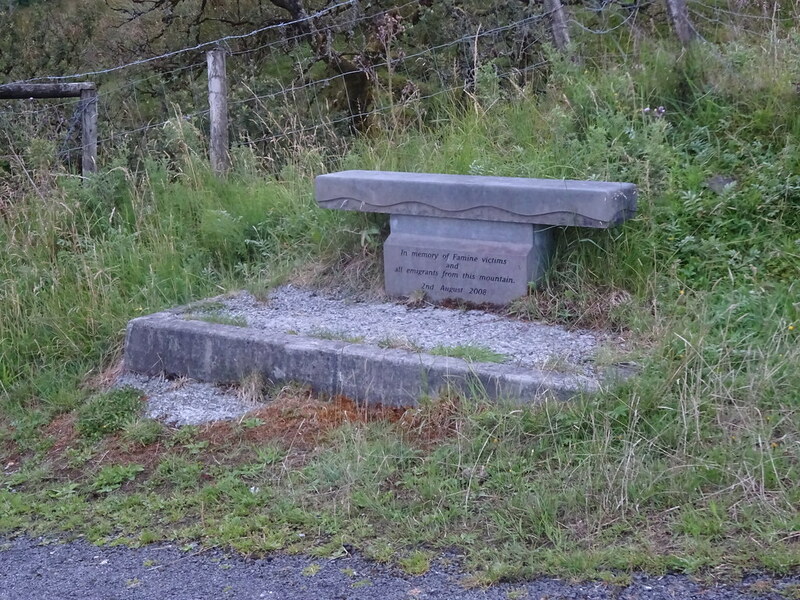 I had no difficulty finding the recommended start point at Mullaghgarve, near which stands a famine memorial, about 1½ miles uphill from the small settlement of Aghacashel. 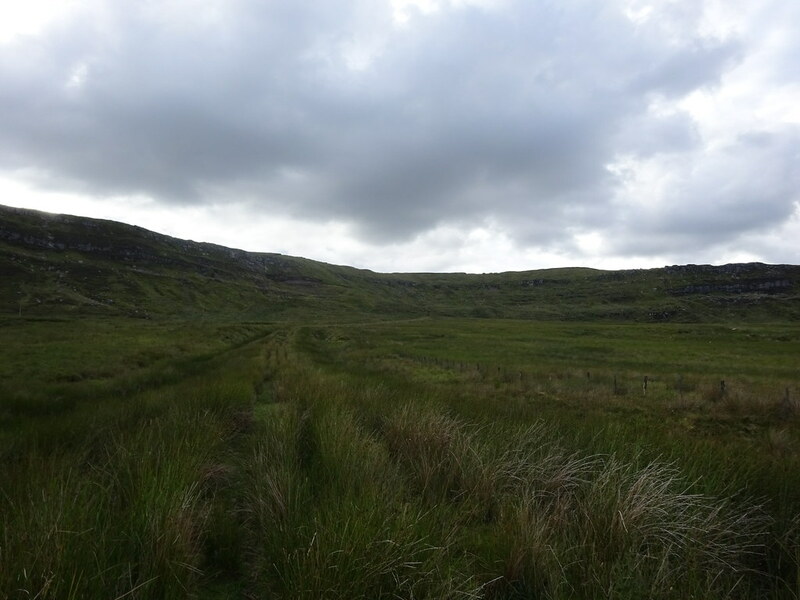 From there a track with a number of gates leads onto a further, rougher track alongside a stream below the mountain. A recycled sheet of plywood makes for a makeshift but effective bridge across the stream, affording ready access towards higher ground at the foot of the cliffs. I made for a point where the cliffs begin to taper off towards the forested south extremity of the mountain and proceeded through an enchanting area where a short climb and a minor scramble over an easily accessible ledge brought me onto the mountain proper. From here there were extensive and pleasant views over West Cavan, lake-dotted Leitrim and the north-western midlands. 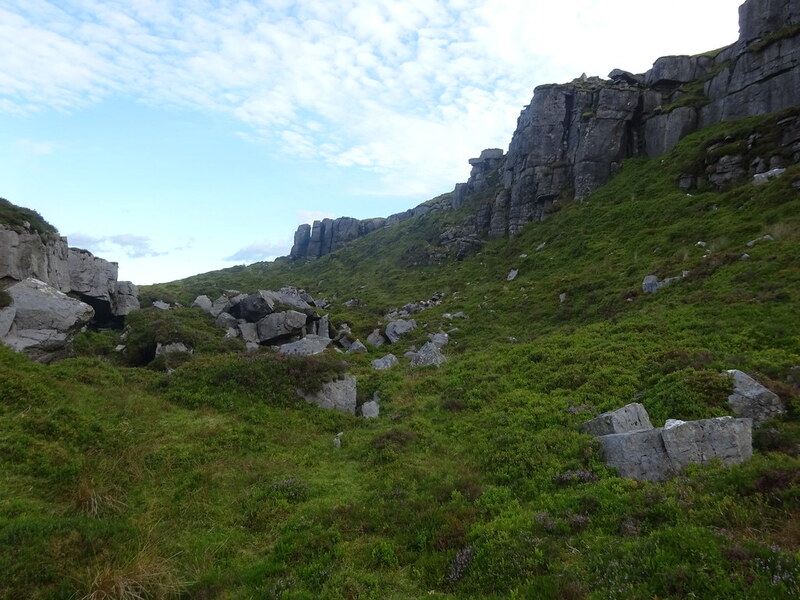 I headed uphill over variously grassy and boggy terrain with only a sketchy idea of where to find the summit. The undulating ground with regular humps and hollows made for an interesting walk and the light breeze was very manageable. I intermittently checked the Peakhunter app on my phone to roughly gauge my progress towards the summit and ended up arriving there about 100 metres earlier than I had expected. 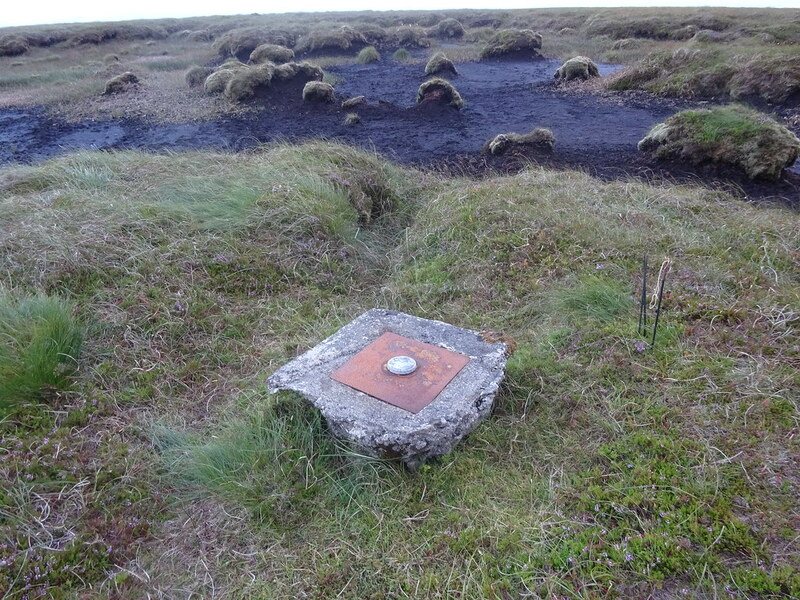 The summit is marked by a low trig plinth which stands on a grassy island in a proverbial sea of peat. It’s hardly the most inspiring of structures but I was glad to see it nonetheless, with striking views in all directions, especially of Cuilcagh to the northwest. Stopping for a quick drink and snack, I turned and headed back in the direction I had arrived. Although the conditions were still good, the sky was by now darkening a little, and an ominous cloud to the west alerted me that rain was probably on its way. On the descent, I opted to steer clear from the cliff area where I had accessed the mountain. Instead I headed straight downhill towards a conifer woodland, at the perimeter of which was a fence and a track down to near where I had started my walk. A walk over rough rushy ground eventually brought me to the stream I had earlier forded via the makeshift plywood bridge. This time I didn’t bother heading back, opting instead to brave the shallow stream. A big mistake, I soon realised, as I sank to my ankles in red-brown gloop, the earth obviously coloured by the iron which gives its name to the mountain. No matter, I was by on the track heading downhill towards my car and, even with wet feet and muddy boots, all was well with the world. Very good Tommy. Peakhunter definitely is a great help to reach the high points.